While it's still very convenient to pick up PS4 games on a Blu-ray disc, if you are anything like us you'll have been tempted by the multitude of downloadable goodies which go on sale from time to time on the PlayStation Store. Factor in an enormous PS Plus backlog, and before long you'll have chewed through all the internal storage on your PS4 and you'll have no option but to delete some of your bigger games and clean away that DLC. Of course, it is possible to upgrade on the internal PS4 HDD with another 2.5" internal hard drive. But this can be time consuming and, if we're honest, a little intimidating for those of you who don't like fiddling with expensive electronics. Fortunately, with all of the recent firmware updates, Sony has made the option of plugging in a USB 3.0 compatible external hard drive easier than ever. So avoid invalidating your warranty and just plug in an external HDD, that's our recommendation. So which is the best PS4 external hard drive upgrade option for you? A lot of this will depend on your budget, we've put together some of our favourite options with varying sizes of storage (and therefore price!) for you below. Of course there is always the option of using a SSD (solid state drive) which offer faster loading times, but these are significantly more expensive. Check out the best PS4 external SSD drives through the link. Below you'll find a list of the best PS4 external HDD upgrades if you're living in the US and Canada regions. You really can't go wrong with any of these options, but take into account storage space and even aesthetics before pulling the trigger. It's also worth noting whether the hard drive you pick requires an independent power source, as some can simply run off the power transmitted by your PlayStation 4's USB port. For those of you in the UK and Europe, you'll find a list of the best PS4 external hard drive options below. As with the US, remember to pay attention to the size of the HDD, as obviously more space will allow you to store more games. Aesthetics are also important if you want your hard drive to look discreet in your media centre. Whichever external hard drive option you pick, you're going to be increasing the storage of your beloved PS4. 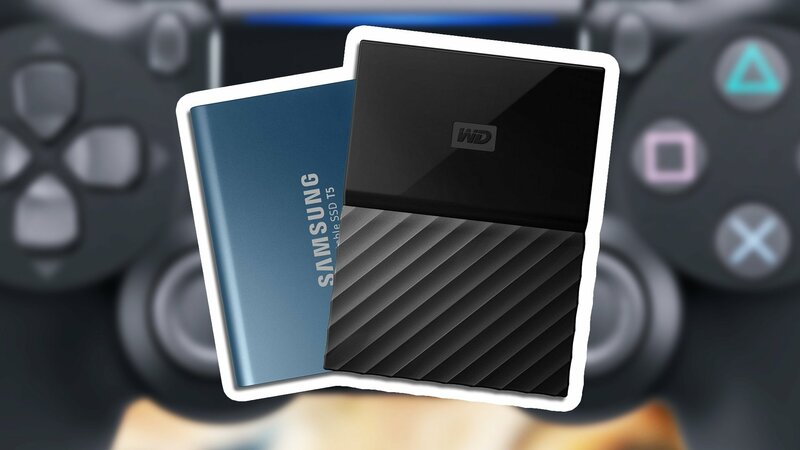 Which external HDD do you use on your PS4? Let us know what your preferred hard drive in the comments section below. With even Physical purchases now requiring a full install, If you intend to keep ALL you games accessible and, like me, don't get rid of games - even if they are completed, then Storage will be an issue. I don't 'buy' digital (at least not generally - I think 5/6 games in over 4yrs and that includes owning both a PS4 and XB1) but I still need to expand my storage. I hate having to wait 'hours' to re-install or re-download games I own and by having limited storage, you are faced with 'deleting' games to make room to add new games - whether those games are 'current' in my playlist or not, I want to know that if at any point I wish to play them, I can just pop in the disc and go - no-reinstalling. When I bought my PS4 Pro, I upgraded to a 2TB and as the PS4 wasn't fully compatible with HDD's, I never bought one. Its been a godsend for the Xbox though as it made it so quick and simple to upgrade to the Slim and now the X - just plug it in and ALL my games were ready to play. Because the PS4 didn't allow for external HDD support - at least not so the games could play from that - I ended up deleting games (I only had a 500GB PS4) and as such, I have a lot of games I can't play instantly - not without re-installing which kind of puts me off from playing games I have in my backlog. If I fancy revisiting Infamous or Killzone, its a lot of waiting around for those to reinstall. Unless you are sure you are never going to play the games again, I would highly recommend getting an external. I have a Seagate Expansion 5TB on my Xbox and have had it for years - It has ALL my Xbox games stored on that (no games are stored internally) and has worked perfectly so I can recommend these models. It turns on/off with the console despite having its own separate power supply too. I will one day look to get one for my PS4 and will spend a day re-installing games from my backlog that I ended up deleting to make room for new games, patches and/or DLC - I had to delete a game to install a patch to play the current game once which annoyed me and it also stopped me adding some PS+ Games to my library because the thought of deleting games I bought just to 'try' a game I wasn't overly bothered about would never happen - if space is never an issue, then you can download, try and then delete without then having to reinstall the game you had to delete to make room. I got the seagate 3tb listed above just after the firmware release that allowed PS4s to use external Hdd. It's a great drive and never let me down, huzzah for the external Hdd!! They should just from the start make 2TB and maybe even 4TB for future consoles. Save consumers the hassle of having to install bigger size hard drives or buy external hard drives which takes up space. Still rocking just my internal 500GB hard drive. I may invest in a larger external drive later this year though. @WanderingBullet Adds to the cost and not everyone wants to pay an extra £100 just for an extra 1TB of storage that they may not need. External offers a lot more flexibility and choice - you can buy what you want, what you need and/or what you can afford - also not tied to buying a specific 'brand', speed or type - If you have the money, you may want a SSD which can cost more than a PS4. With the decision to go for slim internals, these cost more as well as are limited to certain size and with games now necessitating a full install, there will be people that even 4TB won't be enough and so external storage is still a necessity - yet others may only have a small library (or small selection of games at any one time) and will never need more than 1TB so why should they be forced to pay a LOT more for a console just because some may want more storage - it could even make a console out of reach for them. Its easier and cheaper to just increase the storage as and when required by external methods. @BAMozzy That's what having 1TB, 2TB and 4TB options are for. There shouldn't even be 500GB models since game files are so big now. Me too i got it the day external harddrive support want live and i only used about a little over 2TB on about 102 games installed. Since the internal disk in PS4 also works on the USB interface, connecting and running your games from an external drive will have no adverse effects on the performance. EDIT: forget wasting your money on SSD solutions for PS4. As the USB3 interface is used, you will not be able to gain much from that. Juggling games on my HDD (still have a 500GB launch one) isn't too bad I suppose, but as there are certain games I've kept on there to replay, the amount of free space is ever dwindling. The amount required for games is often enormous if they have loads of updates. How much space would I need if I wanted to play Final Fantasy XV's DLC, bearing in mind I deleted the game? @mookysam probably around 100 GB (FFXV without any DLCs and with all regular patches applied is 75 GB if I remember correctly). The Royal edition with high res textures pack is around 150 GB on PC. I’ve got the same 4tb WD passport hard drive it’s work perfectly every day this year. Having this much space has really made me enjoy my PS4 so much more. Just having access to all my games and not having to install again if I want a quick blast on an old classic like driveclub, resogun, battlefield 4 which previously I’d have had to delete to make space for newer games and probably never bothered to install and download the massive patches for plus all the dlc. I got a 5 tb Seagate the moment we were allowed to use external hard drives best purchase I ever made for my PS4. I thought there were issues with having anything over 2tb, am I wrong? @malbhet this was before the firmware version that opened up the external usb drives use for storing game installs. The new limit, if I'm not mistaking is 8 TB. @andreoni79 it is not a problem but a desing decision. The thing is, if you do install an ssd you will see some improvements (depending on a game - in some you will see very little in some a bit) but we are talking insignificant shaving of seconds. You will se nothing like you would do if you would replace a traditional disk with an ssd in a PC with sata6 interface. It is simply a waste of money. From what i read in reviews the Seagate back up Plus will not work with PS4 because of the USB ports on it. I picked up a 8TB Seagate Expansion drive for $149.99 on Amazon. It's faster then the internal on loading games! I love it. @Neolit Good to know. I'll keep using loading times then to sip some beer as usual. Guys am I allowed to post a picture here to show one HDD (that I think is the same as the Seagate 4tb that is in the article) so I'm sure it's compatible with PS4?? I love my ext HD. Seagate 2TB has worked flawlessly. I’ve had it since the update and still only have 1/3 of it filled. I suppose I might hit capacity before the PS5, but I doubt it. I just went on eBay and the Seagate 4tb HDD mentioned above, for £89.99 was on there for just £69.99!! So I snapped it up. Thanks for the nudge Pushsquare (and making me go into my overdraft)!! I personally would avoid any 3TB hard drive because the amount of times I've had them fail over my 2TB drives is amazing. I've had 3 X 3tb from Seagate fail on me in 2 years and all 3 where new and then so far the refurbs have been ok but I've just purchased another 3x 2tb Westerns Digital drives ready to replace my Nas array. I've been in the market for an external drive for a while. Now that I'm getting some money, I might get the 4TB drive. I would get the 8TB, but I'm not sure if I could afford a $200 dunk on my bank account anytime soon. I ended up going with the Seagate 8TB hard drive. It's nice to now have all the games available to play without having to delete anything but I was surprised to see that I haven't even used half of the space available after downloading everything. Guess I could've just gone with a 4TB drive. I just delete and reload from library. Most of the single player games I finish, if I have a physical copy, I flog it to make a bit of cash to buy new games!! I got an external HDD but it's already full! Might have to get the 8TB one! I bought a 3tb external recently (japanese model) and only 2.76tb is available. Is this normal? I wound up getting an 8TB external HDD. It requires its own power source, but it's better than having everything on my internal HDD and two externals. Switching between the two, while managing storage space (both were maxed out) sucked. Now only streaming services and system required game data are on my internal. Some interesting numbers...8TB external, but only 7.35TB available to use. Yes, whatever magic Sony sprinkles into the formatting, it takes up 650GB. That's more space than the launch PS4 hard drive even came with (500GB). Of that 7.35TB, I have used 5.36TB. It's crazy how much memory is required for games these days. I can't imagine next generation. a mistake in the article, installing a internal hard drive DOES NOT void your warranty, just a heads up. @R1spam I do the same, i have a 2tb internal and just delete the games after I have done with them, it's highly unlikely that I will play them again. I've never needed the extra external space yet. @GKO900 I agree, the sizes of some games are already growing and the patches are increasing too, seemed to manage fine for now though. I want to give a warning for anyone using this as a reference for buying a drive: Do not buy a "hub" drive (such as the Seagate Backup Plus Hub) as it is incompatible with the PS4. I bought one late last year while looking for a drive, and the console would not format it even though it recognized it. If you need a 8TB drive, get another option like the Seagate Expansion. The 8TB version of that is also cheaper than the Backup Plus Hub. Do you need a fast data transfer rate? One 4TB I’m looking at from this list is 110MB/s whereas a different one in comparison is 5000GB/s. Does this matter? Not sure if it’s a misprint and it means 5000MB/s but the question still remains? Finally bought 2 TB external driver today. Games are getting bigger and bigger spanning over 100 GB's just for one game. I have 1TB PS4 and just 8-9 games and its already filled. i wouldn't recommend anybody to use an external drive with PS4, as i had nothing but constant problems, eventually leading to entire drive being a write-off that i can only get replaced (not fixed) under warranty, 2tb of games gone. better off replacing the internal drive for something bigger, imo. The WD 4 TB hard drive is the one I have. Works great!